You want quality time with your little one while teaching him God’s Word. 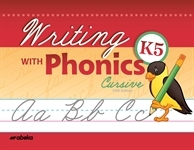 By using Abeka's curriculum specially designed for homeschool, you can cut planning time to a minimum, focusing on that precious time with your child. Tips for Exceptional Teaching: Make this important subject the most interesting subject of the day with this list of simple tips. 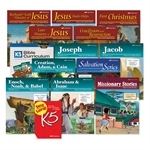 From reciting verses to acting out his Bible stories, your child will love reviewing what he has learned each day. Class Procedure: Give your child a routine he’ll look forward to each day. Bible time includes pledging allegiance to the American flag, song time, memory verse time, Bible doctrinal drill, prayer time, and listening to visualized Bible stories. Who Am I? Play this review game to enhance your child’s understanding and recognition of Bible characters. 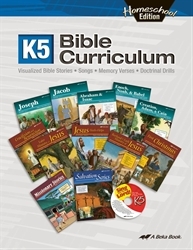 Daily Lesson Plans: With these daily lesson plans, you can focus on what’s important: your child’s growing knowledge of Jesus Christ!